iamafeeder.net » I Can Haz New Toyz? 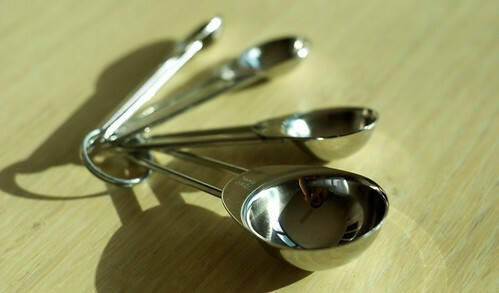 And how about these little measuring spoons? Are these just not ADORABLE? Also, hello, you can see my reflection in the big one as I was snapping this photo. You’ve already seen these measuring spoons in the previous post (spice montage, boom) but I just love them. I know, they’re very standard, but I am all about the functionality and clean, silvery, hygienic feel. I have issues (as the boyfriend likes to continually tell me…). Anyway, that’s about it for now. I just wanted to share the good news. Also, something pretty exciting, this afternoon I’m going down to Mooli’s to have a chat with Mathew and Sam, the co-founders/owners, take some photos and indulge in some Mooli goodness. More about that later, but exciting times! You should check them out – not only do they seem like awesome guys but I’ve only been hearing rave reviews about their Moolis! Right, that’s all for now, I have a really tasty entry to post for my Foodie Project competition in the next couple of days, and if you’re wondering, ‘what on earth is that?’ then you should read this page and get involved! Awesome prize up for grabs! Okay folks, until next time – peace and love. 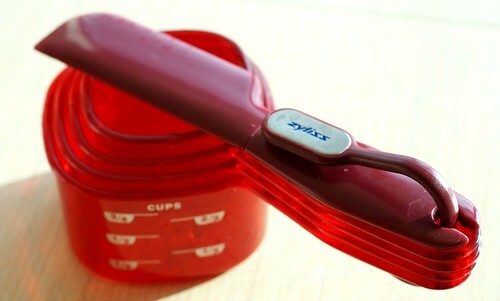 Yeah for cute measuring cups! This is somewhat embarrassing, but I actually take my cups with me when I travel…you never know when you are going to want to bake a cake! Hi, Jax. I was planning on doing the FBFP thang, too, as they just sent me the contract today (does this make us cosmic twins now or are we just ridin' the same gustatory wavelength across oceans?). What prompted you to do FBFP? Monet – that's somewhat adorable… if a little mad. Do you often bake when you're away?! I love it. Dan – we are most definitely twinnies. I'm convinced – our lives match up far too well! I applied for the FBFP because I was writing all these recipes and sharing photos and it just seemed like a waste to only share it with, er, me, myself and I. And as for the cups, they're RED, Dan, RED! You should definitely purchase something red for your kitchen… it needs it, I tell you! Jessica – I know that feeling well. The only thing that stops me from buying everything in sight, is, er, poverty. But a good thing to stop me, eh? ;) Thanks for swinging by! I love that of the whole post that's the phrase you like the most, Ash. It's so true though, right?